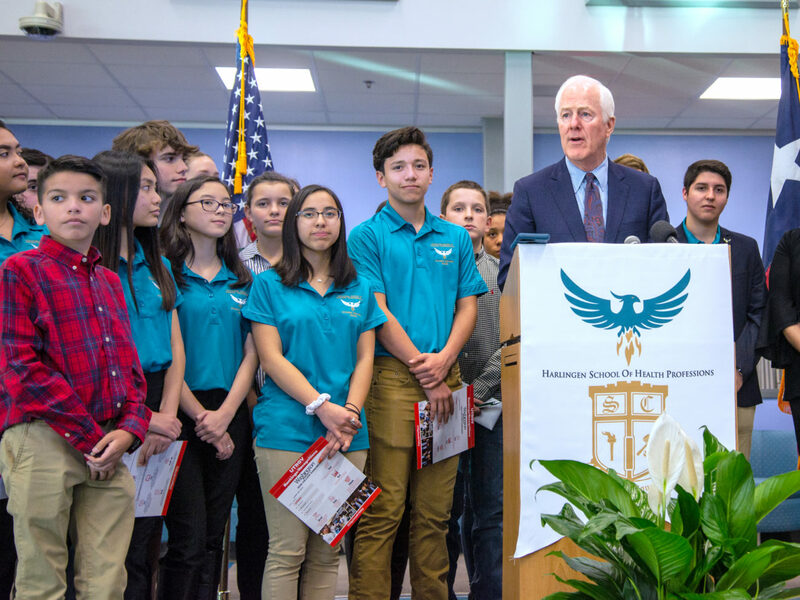 HARLINGEN — Sen. John Cornyn announced the reauthorization of a federal program that helps low-income students achieve college readiness during a visit here Tuesday. The program provides comprehensive services such as professional development for instructors and counselors, as well as better preparing students for college. 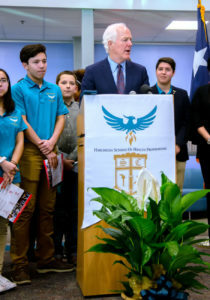 “My goal is to be able to increase it, and we’ll have to make some tradeoffs along the way,” Cornyn said at a news conference at the Harlingen School of Health Professions. Superintendents and other educators from Harlingen and throughout the Rio Grande Valley attended a roundtable discussion about the GEAR UP program at the school. Cornyn then met with several students from HSHP and answered their questions. “I think it’s amazing how many educators joined here to specifically talk about helping students go to post-secondary school,” said Adrian Garcia, junior class president at HSHP. Cornyn said he and other lawmakers are trying to find a way to reduce the local “cost-share” of the program. HSHP Principal Tina Garza was delighted by the news. Harlingen School Board Member Bobby Muniz said the funds are necessary not only for students but also for their parents. GEAR UP funds can be used to help educate parents about applying for financial aid and other matters regarding their children’s education. He said experience has shown that in years when funding is available, student success increases. When those funds are not available, classroom performance decreases. The GEAR UP Program is a competitive grant program that helps low-income and historically underrespresented students achieve college readiness, improve high school graduation rates and post-secondary enrollment rates and raise awareness of post-secondary options among students and families. GEAR UP serves more than 635,000 students across the United States. To be eligible, a minimum of 50 percent of a school’s student body must be enrolled in the federal free and reduced lunch program. Texas students have benefitted from $885 million in GEAR UP grants in the past 20 years.